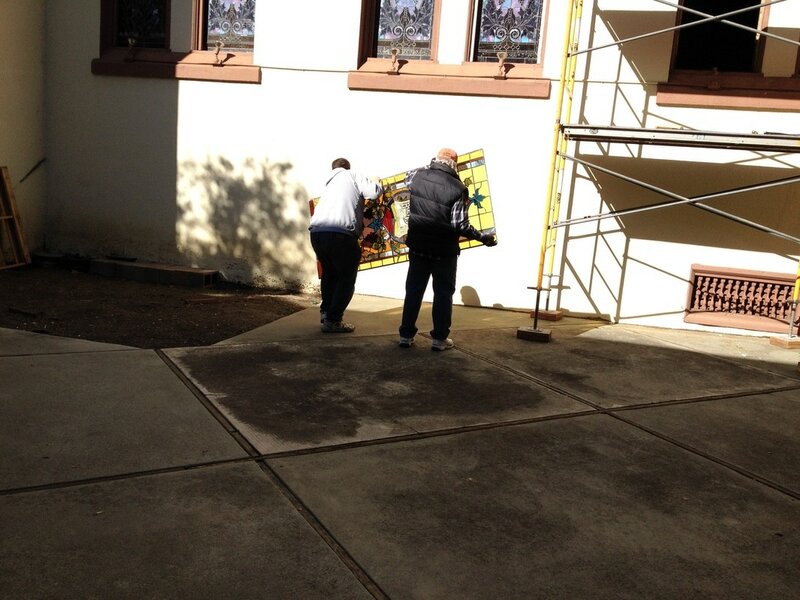 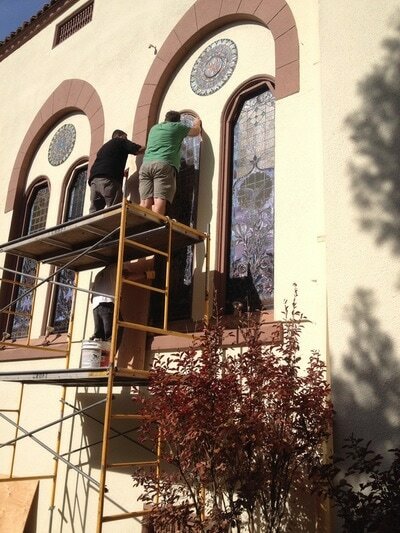 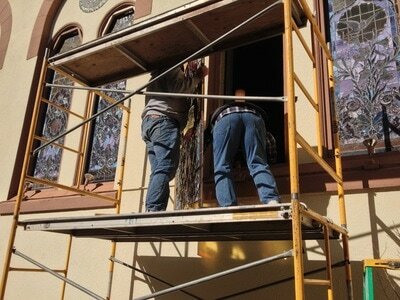 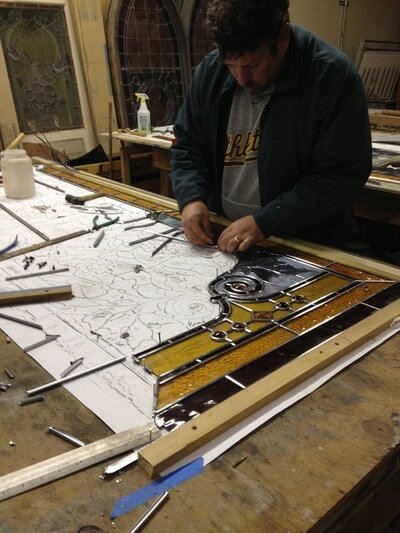 ​Each step is carefully done to protect the windows and to make sure that they are returned in like-new condition. 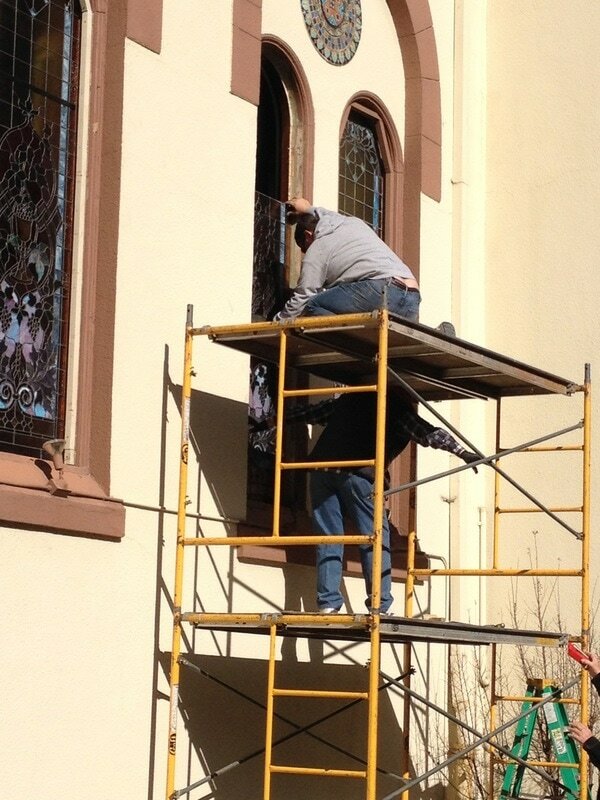 The process starts with the careful removal of the window. Clear plastic tape is put on the back (the external side), so that the window does not fall apart in the move. Slowly the window molding is removed, and a board cut to the length of the window is placed over the window. 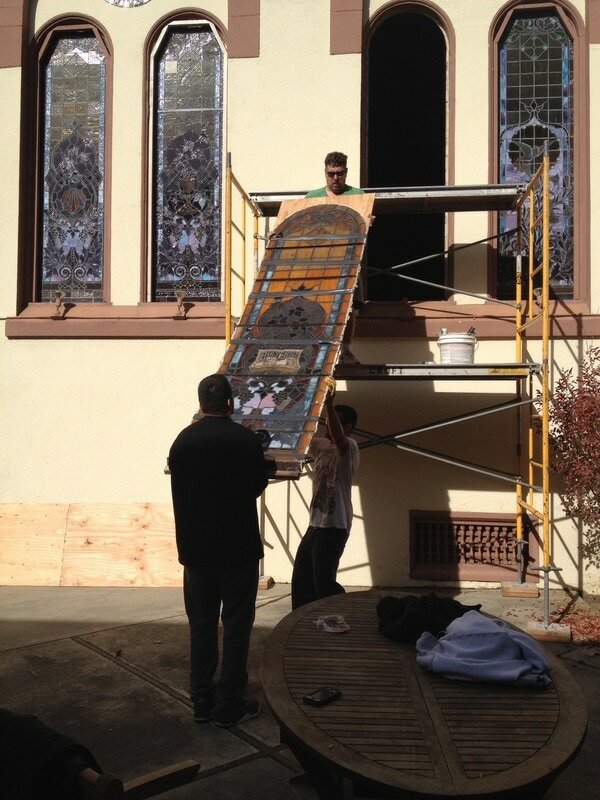 Carefully, the window is released from the sill and strapped down to the board, lowered to the ground, and taken away to the shop. This is what happened today! The next step will be disassembling the window. 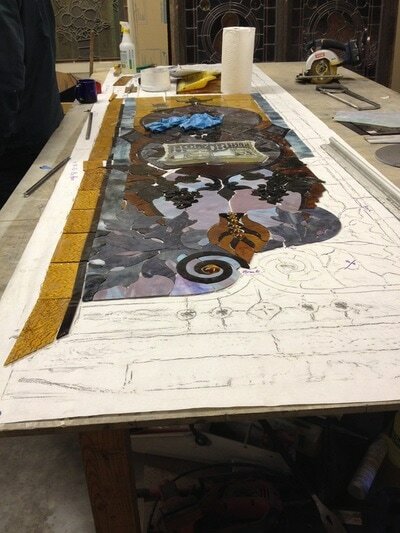 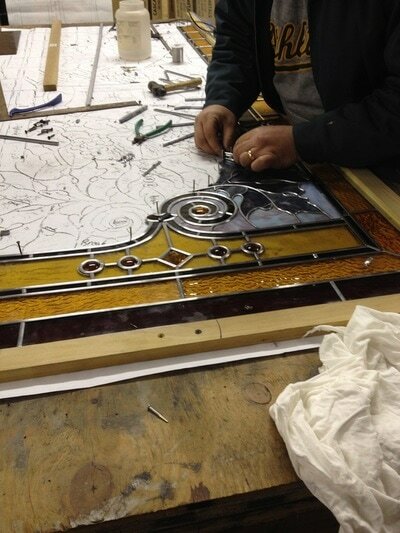 This is a very laborious process, as the window must be catalogued to maintain the integrity of the original work. Many pictures are taken of the window, but the most important thing is the rubbing that is done, which will become the guide when the window is put back together. 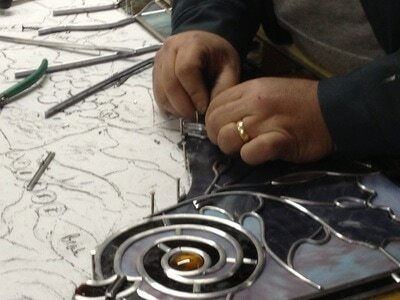 Piece by piece, the lead is removed. And the glass is sequentially placed in a solution of Simple Green, where it will sit for many weeks. 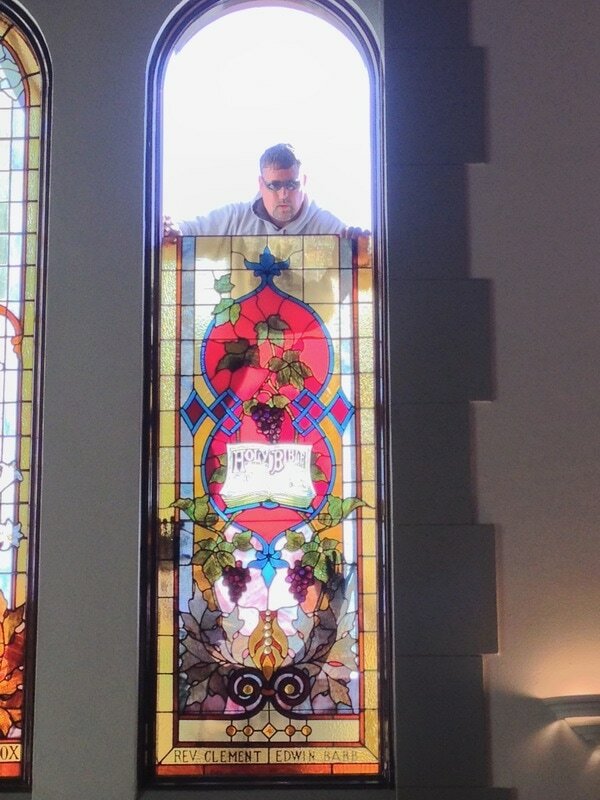 After a month or two of sitting in the solution, just as it was taken apart piece by piece, it is put back together the same way. 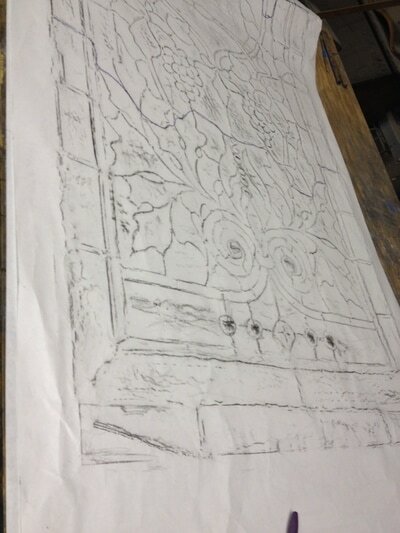 First the window is laid out on one of the rubbings without any lead. At this point, broken pieces are either fixed or, more likely, replaced. 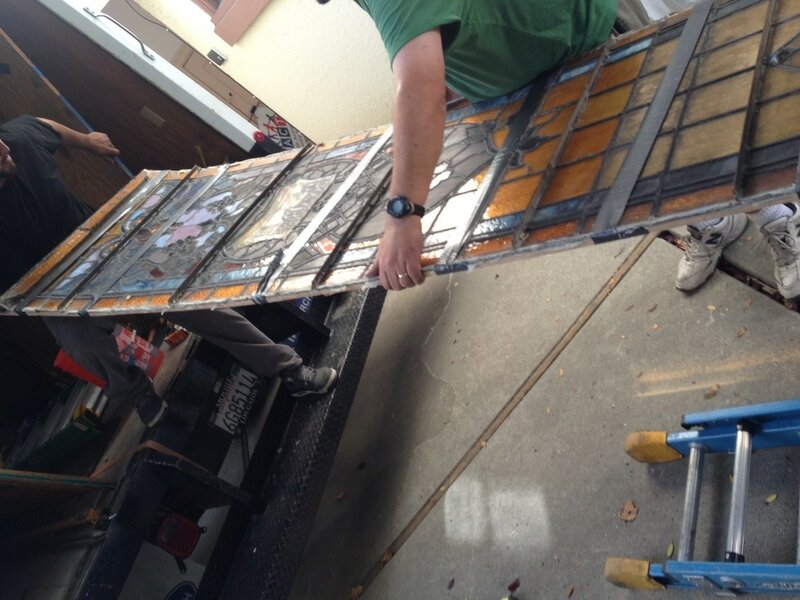 After that, the window is transferred to another rubbing, where the lead composite material is wrapped around each piece of glass. 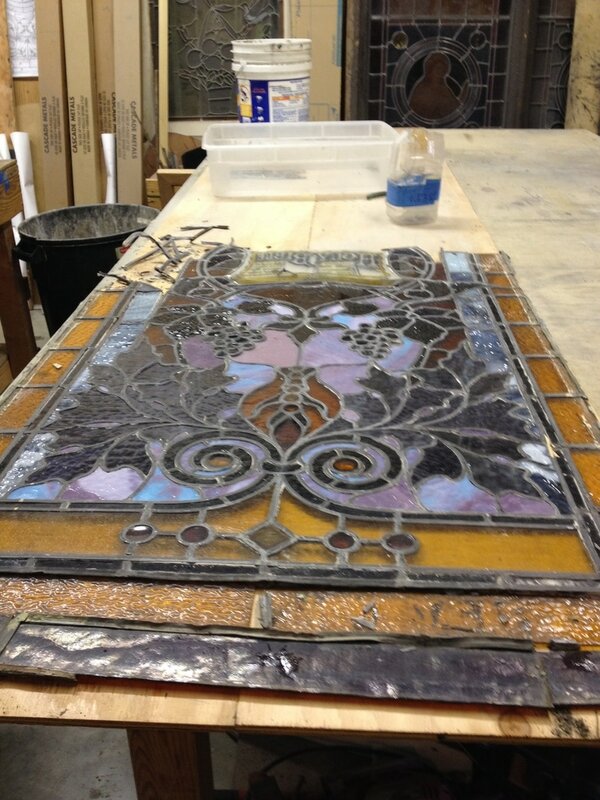 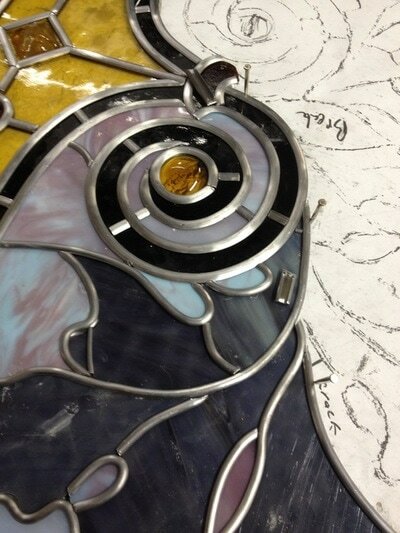 The joints are soldered together, and a compound is placed on the window that will age it so it looks like the rest. 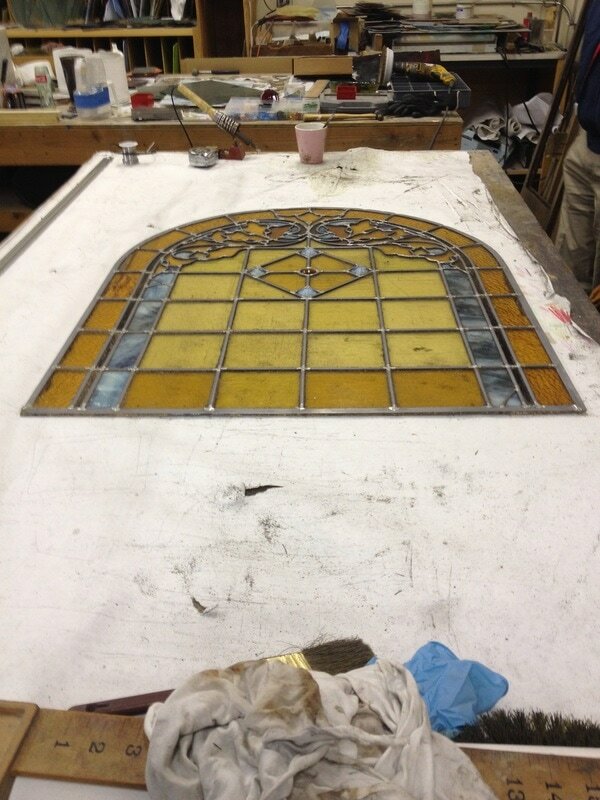 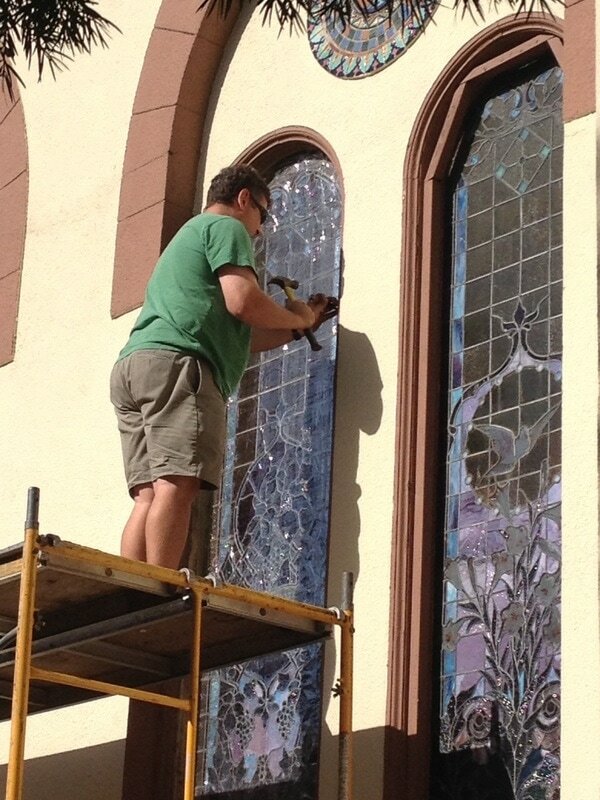 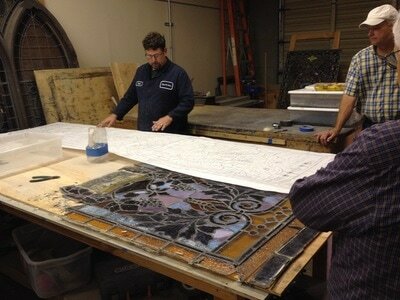 The final process of the restoration is applying a weatherproofing compound to the lead and glass. After two or three months at the shop, the windows will arrive back, but now in two pieces, which is both safer and more stable than before. 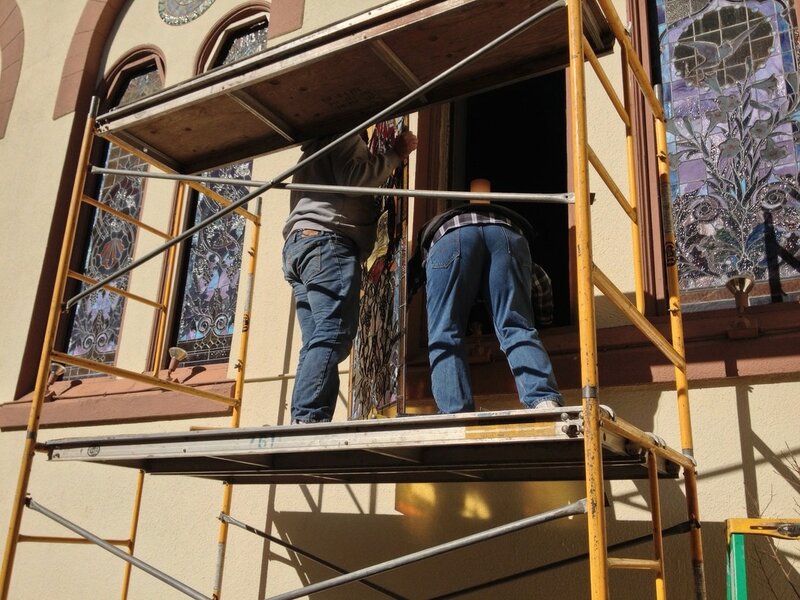 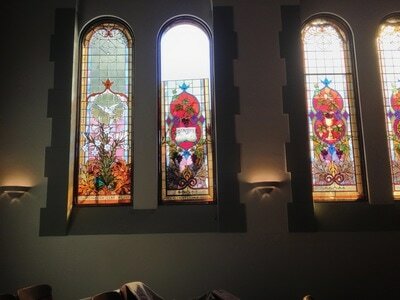 The careful reinstallation of the windows takes about a day, as they are slowly put into the sill, the moldings fixed and replaced, the sides caulked, and then the restored window revealed for the sun to brightly shine through!